Children are fun to be around. 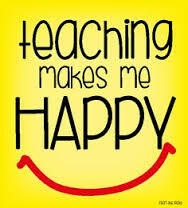 Teaching is a creative outlet- it is never boring! Teaching can be whatever you want it to be! Our curriculum is wonderfully broad- which gives us great scope planning wise. You can be on the move all day. We rarely sit down, unless it is to call the rolla! I know I would simply loathe sitting at a desk ALL day. And imagine only having a desk to yourself, rather than a whole classroom! That buzz/thrill you get when you and your class are really into a lesson and you learn from it together. The shorter working day! I know I do a good bit of work at home so I don’t switch off completely, but it is still nice to be home from work while it is still bright. The holidays! Midterm is just around the corner, then Easter. Also to clarify, we have two weeks and two days off for Easter, not three weeks! The days go by so quickly! So quickly that I never really get that ‘Oh it’s Friday’ feeling. I almost feel as though I am missing out sometimes! Now I do like to see Friday coming, but school is just too busy to be thinking about Friday on a Wednesday for example. You can teach about something you love. And hopefully instill a love in your pupils too for whatever that passion may be.